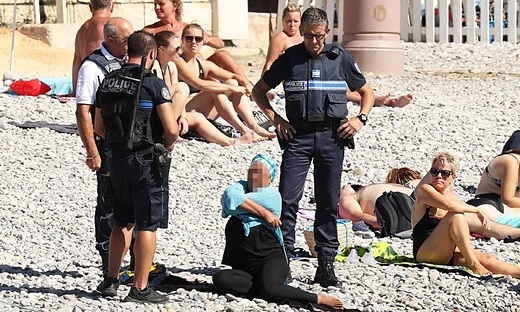 SUBHEAD: Armed French police force woman to remove clothing on public beach. Have they lost their minds? Image above: A ticket given to the woman by police, which said she was not ‘wearing an outfit respecting good morals and secularism’. Police forced her to remove some clothing. From original article. Authorities in 15 towns have banned burkinis, citing public concern following recent terrorist attacks in France. SUBHEAD: France's burkini ban row divides government as court mulls legality. France’s prime minister, Manuel Valls, has clashed with his education minister amid growing divisions in the government over the controversial burkini bans on some beaches. The education minister, Najat Vallaud-Belkacem, one of the Socialist government’s leading feminist voices, was highly critical of the growing number of burkini bans, which have provoked debate after women were stopped by police for wearing headscarves and long-sleeved clothing on the beach. France’s highest court – the state council – began hearing arguments on Thursday from the Human Rights League and an anti-Islamophobia group, which are seeking to reverse a decision by the southern town of Villeneuve-Loubet, near Nice, to ban the full-body swimsuits. Vallaud-Belkacem, who was born into a Muslim family in rural Morocco before moving to France aged four, told Europe 1 radio the proliferation of burkini bans was not welcome. She warned that the bans had “let loose” verbal racism. The Socialist party had previously expressed outrage after a 34-year-old French woman was stopped by police on a beach in Cannes for sitting with her children wearing a headscarf and long trousers and was shouted at by a crowd to “go home”. “My dream of society is a society where women are free and proud of their bodies,” said Vallaud-Belkacem. She warned that with tensions high after a series of terrorist attacks claimed by the Islamic State, “we shouldn’t add oil to the fire” by banning burkinis. But moments after Vallaud-Belkacem spoke, her comments were flatly contradicted by Valls, who reiterated his support for mayors who have banned the garments. Asked if the decrees amounted to racism, Valls said: “No, that’s a bad interpretation.” He said the full-body swimwear represented “the enslavement of women”. Valls has said he supports the mayors who have issued local short-term decrees against burkinis, while refusing their demands for nationwide legislation against them. The state council’s ruling, due shortly, is likely to set a precedent for other towns that have banned the burkini. The administrative court in Nice ruled on Monday that the Villeneuve-Loubet ban was necessary to prevent public disorder after the Bastille Day attack in Nice and the murder of a priest in Normandy. Khan’s counterpart in Paris, Anne Hidalgo, hosting London’s first Muslim mayor, called for an end to burkini “hysteria”, saying authorities should instead focus on improving social cohesion. This was followed by a rebuke from the woman who created the burkini, the Australian designer Aheda Zanetti, who said Sarkozy had misunderstood what the swimwear represented. The political row over burkinis has intensified after a woman in a headscarf was photographed on a beach in Nice removing a long-sleeved top while surrounded by armed police. The city banned the burkini on its beaches last week, following about 15 seaside areas in south-east France where mayors had done the same. The series of pictures, taken by a local French news photographer, showed a woman dressed in leggings, a long-sleeved tunic and headscarf being approached by four officers. As the police stand around her, she removes her long-sleeved top, revealing a short-sleeved top underneath. It is unclear whether or not the woman was ordered to do so. In another image, a police officer appears to write out a fine. The Nice mayor’s office denied that the woman had been forced to remove clothing, telling Agence France-Presse that she was showing police the swimsuit she was wearing under her tunic. Nice’s deputy mayor, Christian Estrosi, from Sarkozy’s Les Républicains party, said a municipal police team had “acted perfectly to make sure that [the] decree was respected”. He threatened legal action against anyone disseminating pictures of municipal police. Twenty-four women have been stopped by police in the city since the burkini ban came into force. The woman in Cannes, a former flight attendant from Toulouse who gave her name only as Siam, said she was wearing clothes and a headscarf when she was approached by police who wrote on her ticket that her clothes did not conform with “good manners” or French secularism. The various mayoral decrees do not explicitly use the word burkini; instead they ban “beachwear which ostentatiously displays religious affiliation”, citing reasons such as the need to protect public order, hygiene or French laws on secularism. The state council’s ruling, due at 3pm (1pm GMT) on Friday, is likely to set a precedent for other towns that have introduced bans.